For A’s 1st Birthday (aka the party you invite a million people to, basically to celebrate the fact that you kept a human alive for 365 days) we (a.k.a. 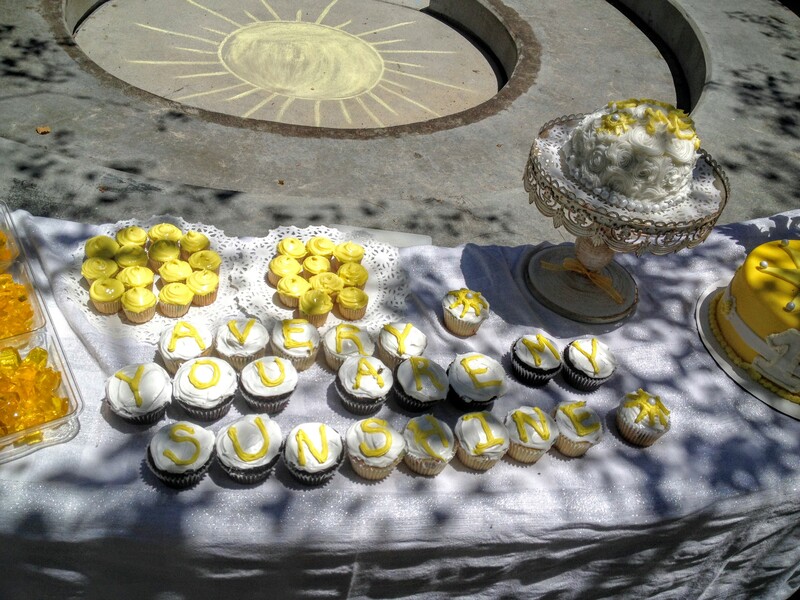 me) chose a ‘You Are My Sunshine’ theme based on one of our favorite lullabies to sing to Avery and the inspiration for his nursery. The day was filled with love, family, friends that have become a second family, hot sunshine and decorations made with a whole lot of love and a little bit of creativity. 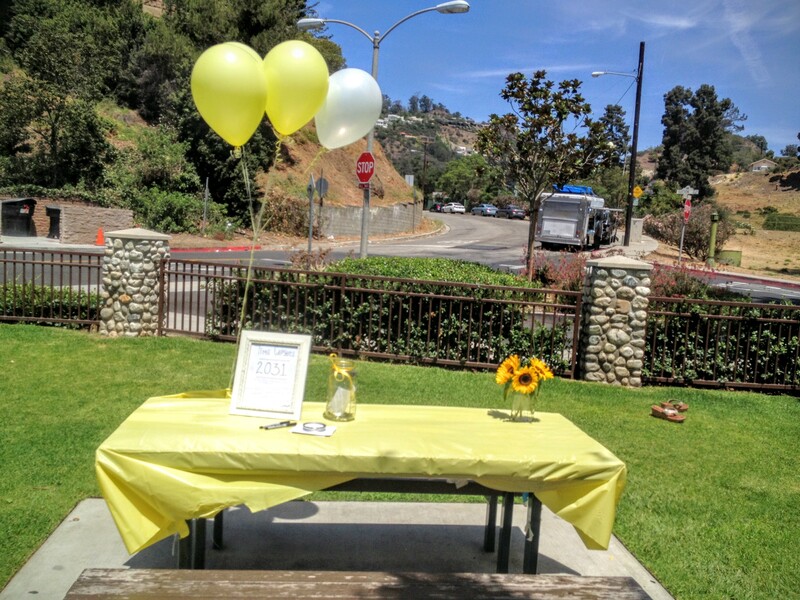 PS…having a birthday party at a local park is awesome – the little ones can run around to their hearts’ content, it’s free (or super cheap if you have to reserve tables), AND the best part is you don’t have a dirty house after! 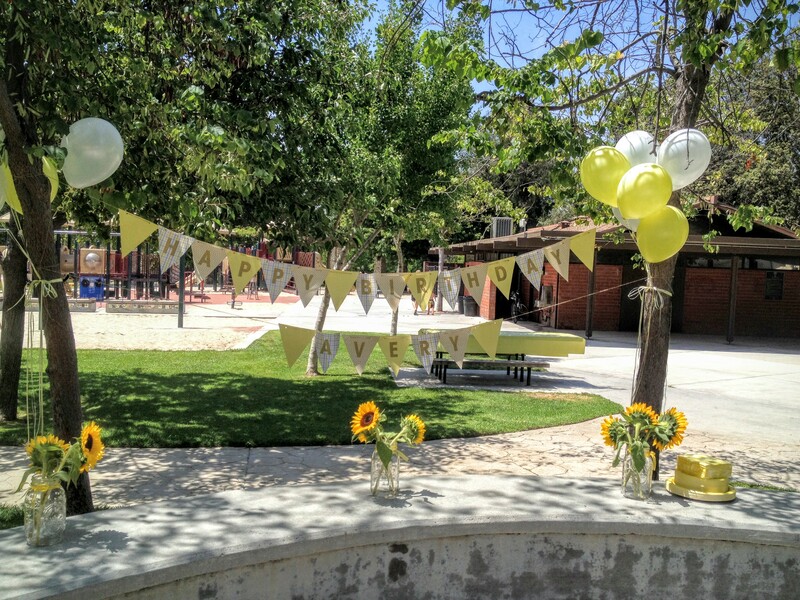 We held the party at a local park, which happened to have an amazing little concrete “amphitheater” that made the perfect set up for food, favors and mingling. 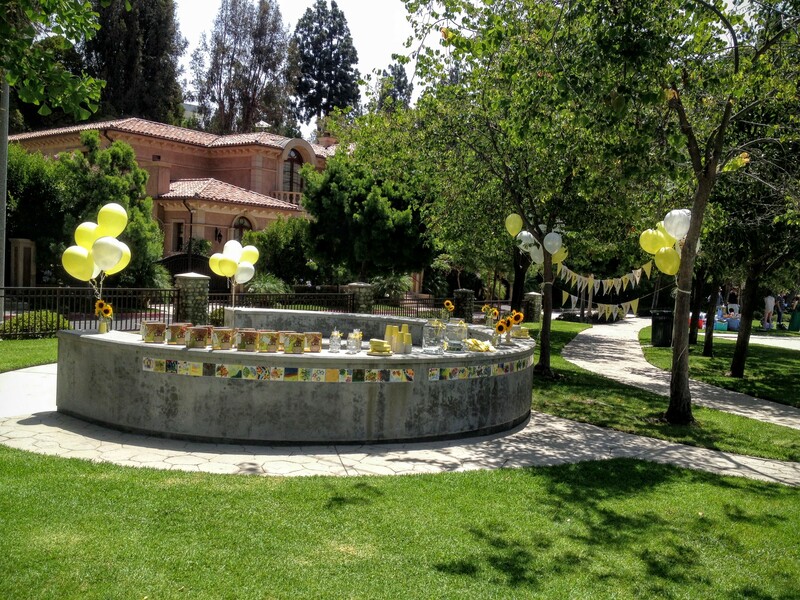 We got yellow and white helium balloons that we tied to trees and placed around the party. 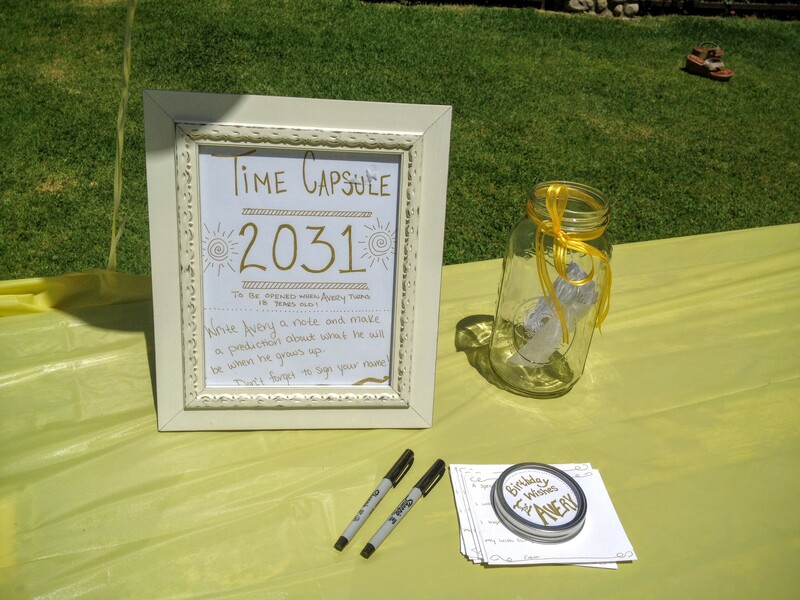 The entry table for gifts had a Time Capsule for guests to write a little message for Avery to open and read on his 18th birthday. I made the sign by using a gold paint pen on white construction paper and placed it in a vintage photo frame I found at TJ Maxx. 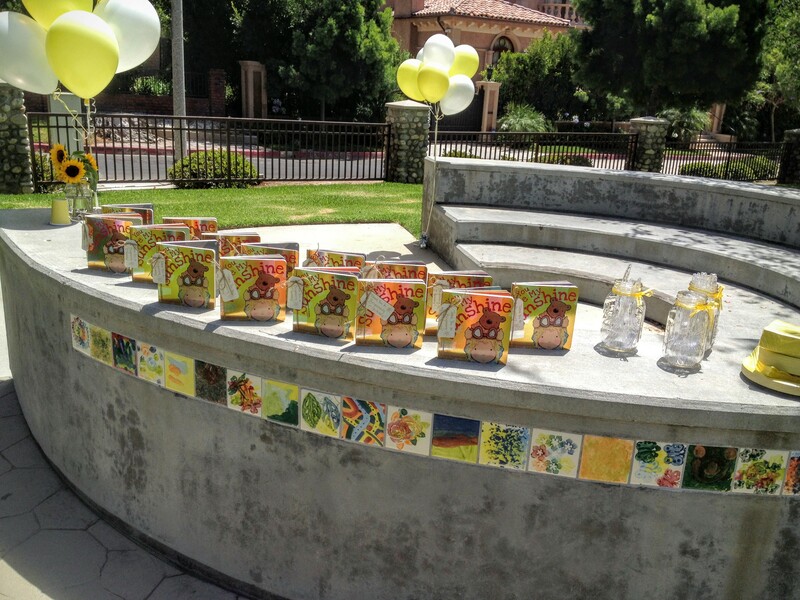 Then the actual time capsule (along with many other things) was a mason jar with a yellow ribbon tied around it. 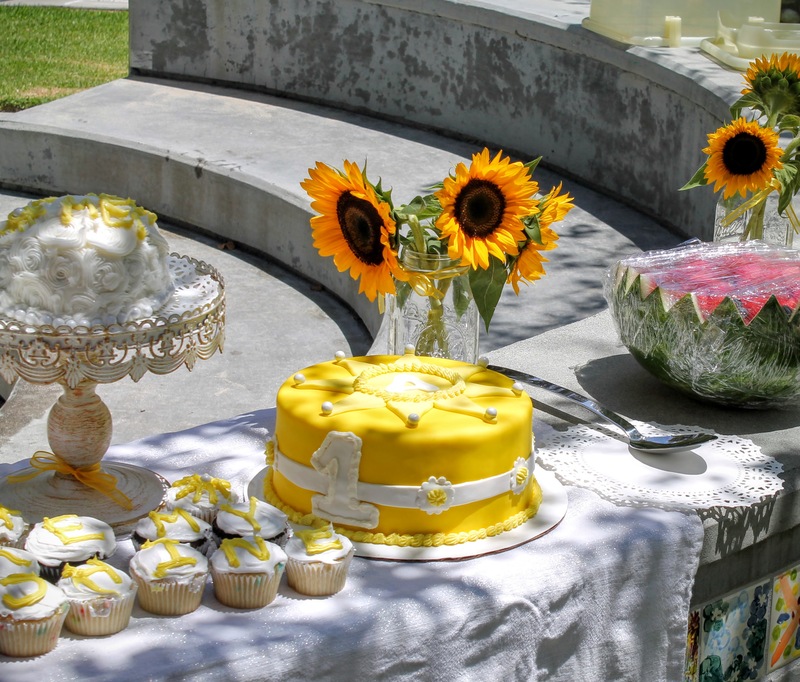 I also mason Jars as vases to place fresh sunflowers in around the party. The mason jars also held the utensils and napkins. I served water and lemonade out of two large glass containers I found at Bed Bath & Beyond and got pale yellow paper plates and bowls. 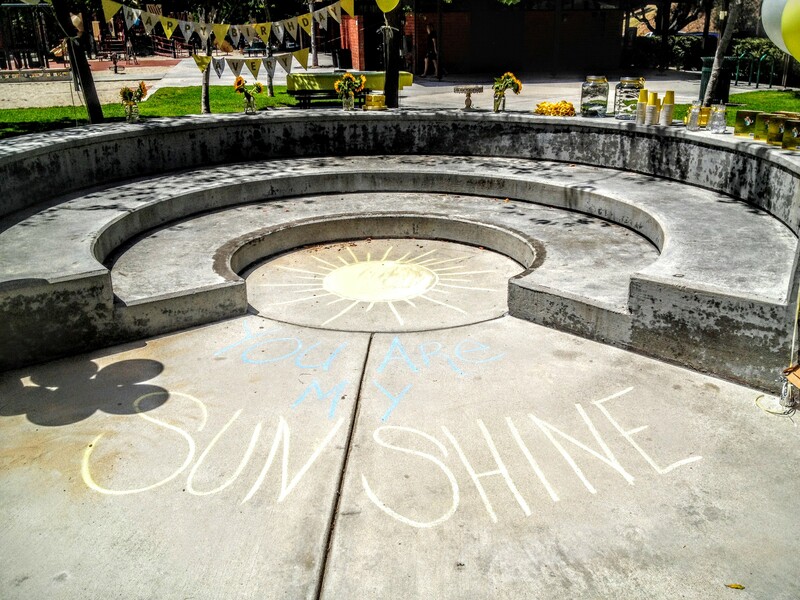 I used chalk to draw a giant sun and write “You are my Sunshine” in the center of the ampitheare, and then left the rest of the chalk out for the little ones to play with. 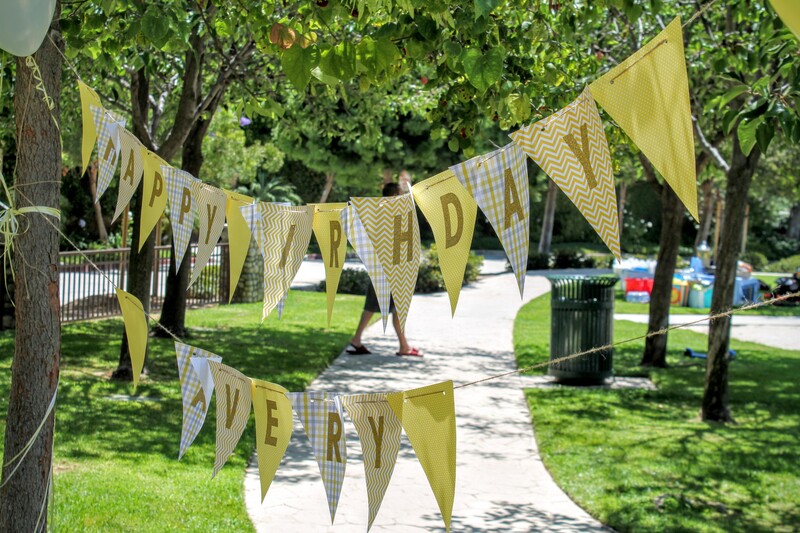 I made the Happy Birthday banner using three different patterned yellow and grey papers from Michaels that I cut into triangles. I alternated patterns and used gold letter stickers (also from Michaels) to spell out Happy Birthday Avery on the pendants. Then I punched two holes in each pendant and strung them through twine to hang them. I used the same patterned paper to make this adorable DIY Photo Booth for the little ones. 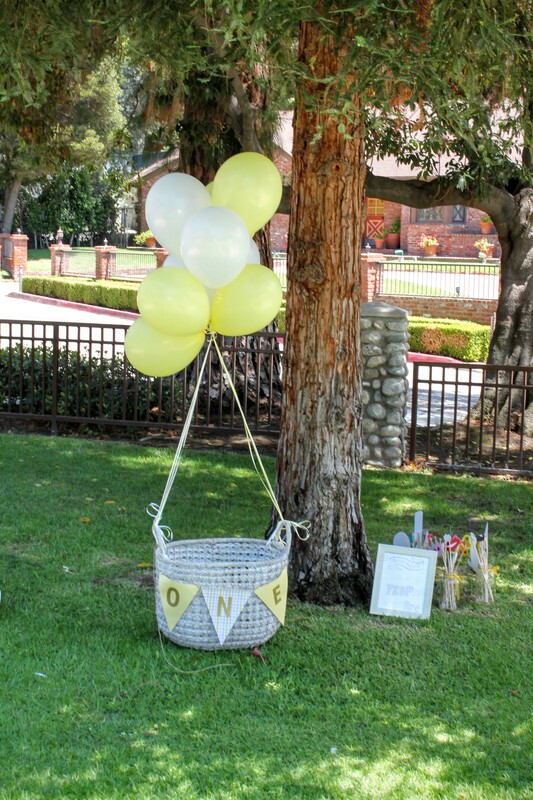 I found the basket at Cost Plus World Market, tied yellow and white helium balloons to each side and then tied it all together at the top. I made a banner sign that said “one” and tied it across the front. I found another vintage looking photo frame at TJ Maxx and wrote a sign in gold paint pen on thick white paper that said “Photo Booth Grab a prop and strike a pose!” Next to the framed sign I placed photo booth props that I made from a kit I got at Michaels in three large mason jars with yellow ribbon tied around them. For food I kept it simple with watermelon, yellow sunshine shaped jello, and pizza (we ordered and had delivered to the park 1/2 way through the party.) Then I baked cupcakes, made a smash cake for Avery and decorated a cake to serve at Duff’s Bakeshop. 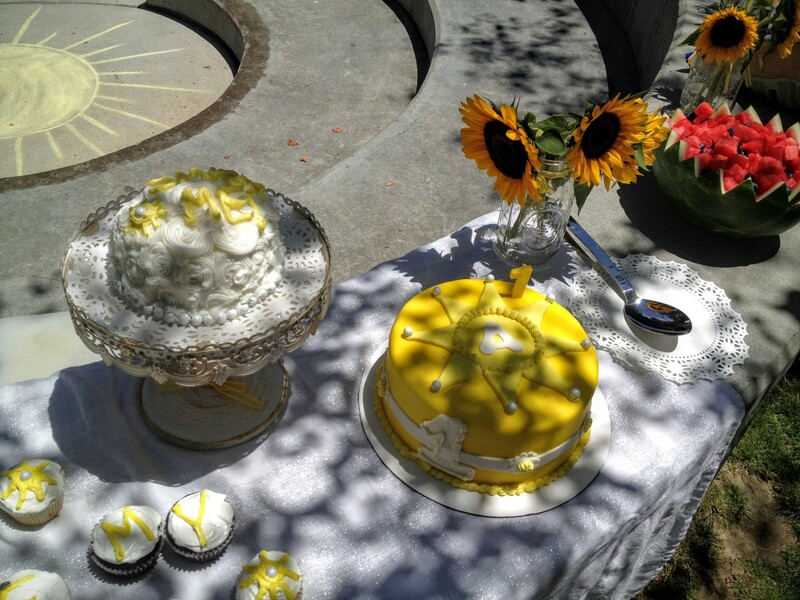 I had a blast planning, making and decorating this party…but more importantly, the celebration was so much fun. Avery wanted nothing to do with the smash cake, the kids looked adorable in the photo booth, and everyone left covered in watermelon juice, pizza sauce and frosting…signs of a party well spent.